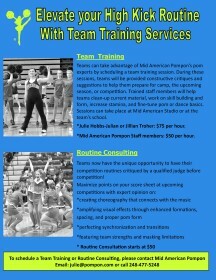 Teams can take advantage of Mid American Pompon’s pom experts by scheduling various team training options. Teams can be provided with constructive critiques, suggestions, and skills to help them prepare for camp, the upcoming season, or competition. Trained staff members will help teams clean-up current material, work on skill building and form, increase stamina, and fine-tune pom or dance basics. Sessions can take place at Mid American Studio or at the team’s school. For more information please click to download the Team Training Services Flyer or contact us today!